October 14th 2017 is the beginning of the 6th annual National Hate Crime Awareness Week. 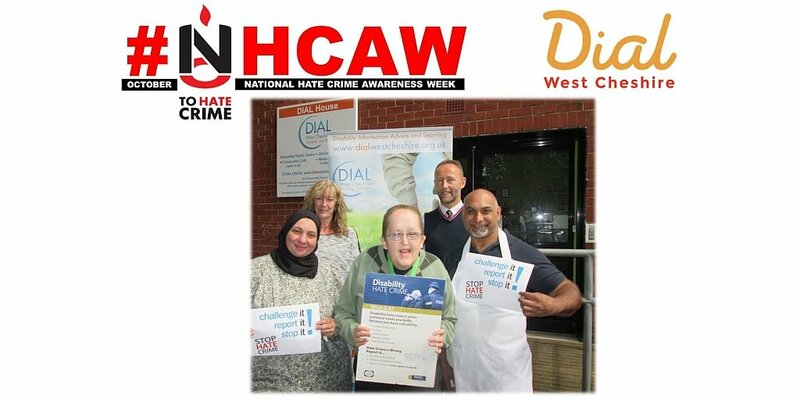 DIAL West Cheshire (DIAL House) is pleased to support “Hate Crime Awareness Week”. DIAL is working with the police to help raise awareness of ‘Hate Crime’. A Hate Crime is an offence committed against a person or property which is motivated by hostility or prejudice because the victim is seen as being different (e.g. disabled). The DIAL House Disability Rights Centre in Hamilton Place is a Hate Crime Reporting Centre where victims and witnesses of incidents can report what has happened to them as well as seek support and advice to help them cope and recover. It is believed Disability Hate Crime in particular is under reported in Cheshire and DIAL are encouraging people who have been the victim of a hate incident, or who would like further information, to contact the police directly or alternatively approach the charity’s friendly staff and volunteers in the strictest of confidence. Please call 01244 345655, use our contact form or email contactus@dialwestcheshire.org.uk.